and duty of these men. to the "Captain of our Faith." 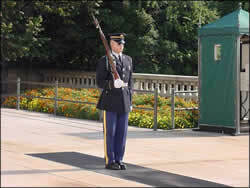 Standards for the one guarding the Tomb of the Unknown. begin his return walk and why? the time, and if not, why not? He carries the rifle on the shoulder away from the tomb. After his march across the path, he executes an about face, and moves the rifle to the outside shoulder. For a person to apply for guard duty at the tomb, he must be between 5' 10" and 6' 2" tall and his waist size cannot exceed 30". The guard must obey these rules for the rest of their lives or give up the wreath pin. Guards dress for duty in front of a full-length mirror. people laid to rest in Arlington National Cemetery. A guard must memorize who they are and where they are interred. Among the notables are: President Taft, Joe Louis (the boxer) and Medal of Honor recipient Audie Murphy, (the most decorated soldier of WWII) of Hollywood fame. uniforms ready for guard duty.